This model includes an accurately detailed Hercules engine and the observer's .303 Browning machine gun. In service from 1939 to 1960 in RAF (UK), RAAF (Australia), RCAF (Canada), SAAF (South Africa), FPAF Poland), FAR (Fleet Air Arm), USAF(USA), and the air forces of New Zealand, Portugal, Israel, Turkey and the Dominican Republic. 5928 were built in Britain and Australia. The crew was a pilot and an observer. Dimensions were: Length: 41 ft 4 in (12.6 m); Wingspan: 57 ft 10 in (17.65 m); Height: 15 ft 10 in (4.84 m). 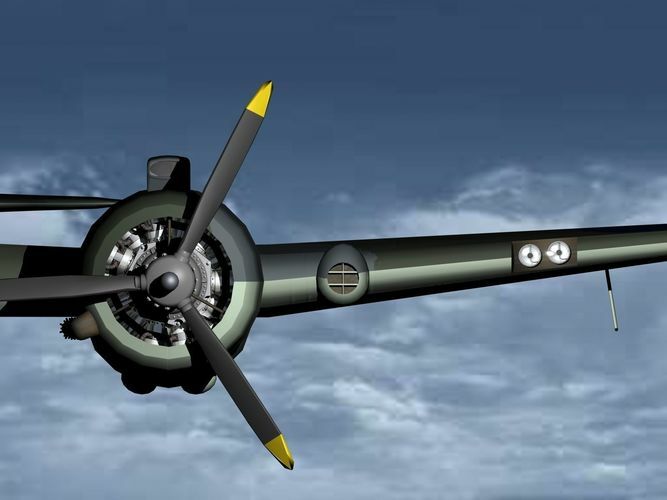 It was powered by two Bristol Hercules 14-cylinder radial engines of 1,600 hp (1,200 kW) each. The Beaufighter was the most heavily armed fighter aircraft in the world with 4 × 20 mm Hispano Mk II cannon under the nose and 6 x .303 in (7.7 mm) Browning machine guns in the wings. Some variants also had a manually operated .303 in (7.7 mm) Browning for the observer. In addition to which it could carry external loads of 2 × 250 lb bombs or 1 × British 18 inch torpedo or 1 × Mark 13 (US) torpedo or 8 × RP-3 60 lb (27 kg) rockets under the wings.